Candidate factors do exist for such a signal. In inter-neuronal synapses, signals including FGFs, WNTs, neurotrophins, and neurexin/neuroligin interactions have been implicated; however, it is unclear to what extent these factors play a role in synaptogenesis at the NMJ. 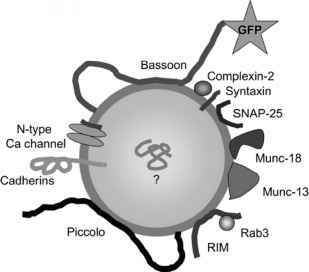 Another system implicated in the determination of presynaptic morphology is ubiquitination62. This was first reported in Drosophila and C. elegans, where mutations in highwire and rpm1 (regulator of presynaptic morphology 1), respectively, cause defects in presynaptic differentiation, leading to ineffective synaptic transmission63-65. The highwire and rpm1 genes encode E3 ring finger ubiquitin ligases. The mammalian ortholog of this gene is protein associated with Myc (PAM)66. An analogous role in mammalian presynaptic differentiation was indicated by an analysis of mice lacking Phr1 (for PAM-highwire-rpm1), generated by combining narrowly overlapping deficiencies67. These mice die at birth with apparently ineffective NMJ synaptic transmission, and defects in both sensory and motor-nerve terminal morphology. How ubiquitination influences presynaptic morphology and synaptic function is intriguing, but largely unanswered.